Extending over an area of around eight hectares around the Normandy island of Tatihou, our Jardins Ostréicoles are farmed at Saint-Vaast-la-Hougue (Manche), in the heart of the Val-de-Saire, on the north-east coast of Cotentin. In a stunning setting divided between surf and turf, town and countryside, our geographic location offers remarkable access to all of France as well as Europe and the world. The quality of our products and the satisfaction of our customers are our key values. At each stage in the farming process, our oysters and minutely controlled in line with applicable food standards. Every week, our professionals check the hygiene quality of the oysters. 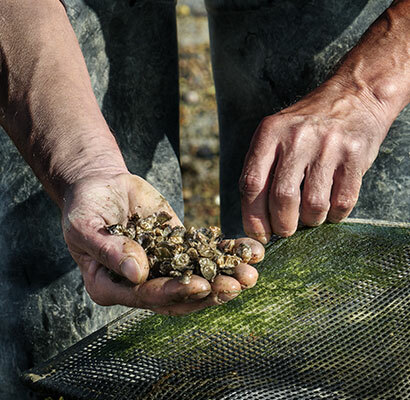 Tradition and modernity are our two guiding principles: although we farm our oysters by hand, continuing the artisan movements and methods of our ancestors, the process is rigourously monitored on the basis of cutting-edge biological and environmental expertise. We encourage the local identity of our products. This is why our oyster spats are supplied by the hatchery in Gatteville-le-Phare (Manche), situated within twenty kilometres of the oyster farm. We are proud of our brand, “Les Jardins Ostréicoles de Tatihou”, and guarantee the origins of the product to our clients. We have committed ourself to only supplying oysters which have been raised by us in our farms. Our varied team, consisting of 12 marine gardeners guarantees the continuation of traditional expertise. They are all permanent members of staff and share the same love for a job well done. Multi-talented and with complementary skills, each of them can operate at each stage of the process, from farming to maturing, from quality control to packaging. Gourmets of all nationalities enjoy oysters from Les Jardins Ostréicoles in Tatihou ... and they spread the word. in Asia: Hong Kong, Malaysia, Singapore, Taiwan, etc.